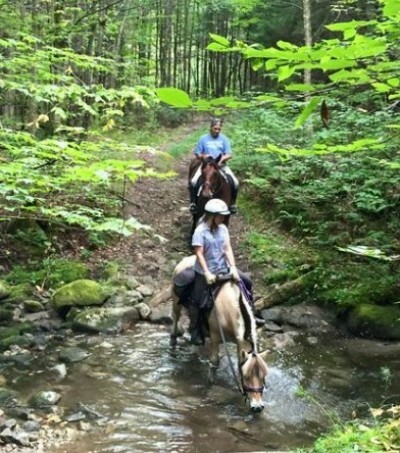 The NEKET system is an ongoing project of the Vermont Horse Council (VHC) in partnership with the Agency of Natural Resources. VHC’s NEKET Trails Committee manages the trails located on the Kingdom Heritage Lands. The Committee’s purpose is to promote the development of horse trails on these lands. A majority of the trail system is located on public lands, but segments are on private property. The trails include nearly 24 miles of existing roads in the West Mountain Wildlife Management Area and 12 miles of roads on Plum Creek Timber Company property, including active logging roads. Equestrian trails are designated by the VHC and the ANR. The trail system is open following mud season and closes on November 1. Many of the trails/roads are actively used for the removal of logging products so you may encounter logging equipment and other motorized vehicles.